Looking for a warm, funny romance for the holidays? 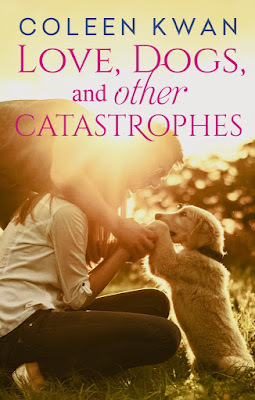 It's release day for LOVE, DOGS, AND OTHER CATASTROPHES! Dog person, cat person: Joel Winslow is a money person. PetzBizz is facing bankruptcy, and it’s his job to fix it. Shoring up a business often means hard decisions, but Joel knows that short term pain leads to long term gains, and it is in everyone’s best interest to keep the doors of PetzBizz open. If only he can convince Andrea, the prickly part-time clerk determined to get in his way. Andrea Ho understands jargon, and ‘restructuring’ means ‘slash and burn’. The last thing PetzBizz needs is some corporate drone coming in and making decisions based on money instead of compassion. But Joel comes with three adorable if unruly dogs, and Andrea is desperate for some extra cash. A side job doing something she loves seems like a perfect solution—and it allows her to keep an eye on Joel and PetzBizz. Unfortunately, Andrea likes what she sees just a bit too much for her own comfort—and it looks like Joel feels the same way. Opposites may attract, but different values aren’t the basis for long-term happiness. When it comes to a choice between love and money, only one can win.